Inevitably, you collect a lot of tickets on your travels. These little pieces of paper serve as a great reminder of all the amazing things you have seen and done. When we finally finished our first big trip two years ago, I had a shoe box full of tickets from our two months abroad which I had no idea what to do with. I didn’t want to chuck them out, but I am not much of a hoarder so keeping them in the back of the closet was out of the question. I trawled through Pintrest trying to get some inspiration for what I should do. Honestly, everything I saw was too crafty and messy looking for my liking, so what I came up with was nothing like anything I had seen in my research. Sort out all of your tickets so you can see what you have, removing all duplicate tickets. Measure out a square, 2cm x 2cm, on the clear plastic sheet and cut out as accurately as possible – this will be your template for all the ticket tiles. Check your measurements are accurate and start again if necessary. Get your ticket, place the plastic template over the most interesting looking part, and trace around with a pencil. Cut this out as accurately as possible. Turn the ticket tile over and lightly draw a cross on the back so you remember what side of the tile you want to use in your mosaic when you come to putting it all together. Store all of the ticket tiles in a small ziplock bag. Continue to cut out your ticket tiles. I made a mosaic that ended up being 20cm x 20cm, therefore, I needed to cut out 100 tiles. This part of the project takes the most amount of time, so I would recommend doing this over a number of evenings while you are watching TV or listening to music. Make sure you cut out more tiles than you will need for your mosaic so you have extra to play with if some don’t look right. Set up your tiles in the order you would like them to be in your mosaic. When I did this, I first sorted the tiles I had into categories so I could evenly distribute them over the mosaic. How I sorted the tiles were: black and white, transport (coloured), activity (coloured), and maps. Play around until you have all of the tiles in your 10 x 10 square and are happy with how they all look together. Cut your white paper down to the size of the frame. Measure where you want the mosaic to sit in the frame. I used faint pencil lines for the outline of the square as they would eventually be covered by the edge of the tiles. Begin to stick the tiles to the white paper. I began by doing all of the outside tiles first so that there is a crisp outline the whole way round. Fill in the rest of the tiles, being very pedantic about the placement of each one as this needs to be perfect. Wait for the glue to dry before placing in the frame. As I said earlier, this project was very time consuming, but I absolutely love the way they have turned out. 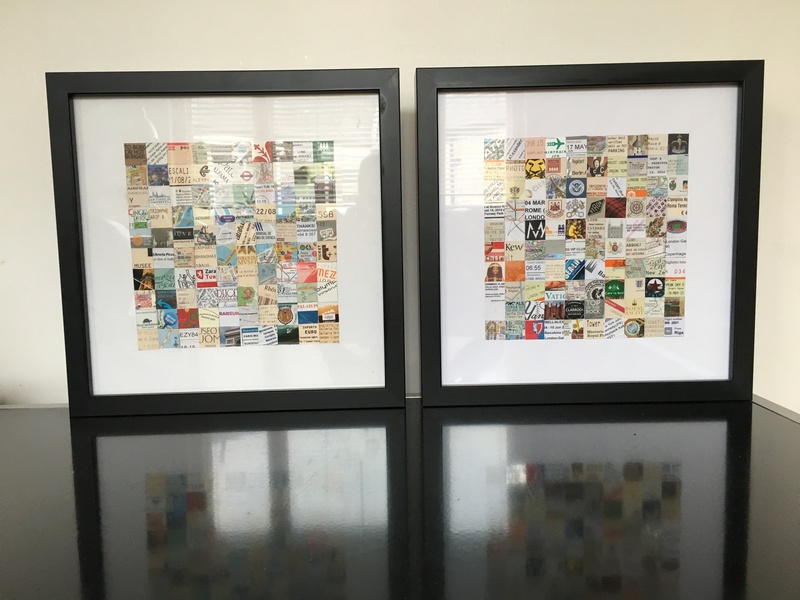 I now have two collages, once representing our travel in 2014, and one for 2015. Let me know if you have done anything creative with your travel tickets once your trip is over.